HCBS waiver regulations require that any facility in which waiver services are furnished must meet applicable state standards. When services are furnished by the assisted living facility, the facility must meet the standards for service provision that are set forth in the approved waiver documents. 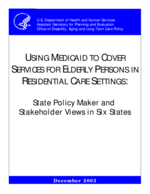 Thus, states planning to cover assisted living through a waiver program need to be sure that the admission/retention provisions of state licensing requirements permit assisted living facilities to serve individuals who meet Medicaid's nursing home level-of-care criteria. Licensing must also address a facility's qualifications to provide assisted living services. In a few states, the facilities do not themselves provide these services. Instead, outside agencies come into the facility to provide them. For example, Minnesota covers assisted living provided by outside agencies to residents of facilities that provide only room and board and limited supervision. In such cases, the facility may need to meet only minimal housing standards, while the outside agency may be held to state licensing and program standards for home care providers. Residents in such settings may be personally responsible for making arrangements with an outside agency for service delivery, or, more typically, the state may provide case management services to assist the resident in doing so. States that use a waiver program to provide assisted living need to contract with facilities that are willing and able to provide the services needed by someone who meets the state's Medicaid nursing facility level-of-care criteria. The assisted living industry is perceived as generally serving people with lighter needs. For example, about one-quarter of assisted living residents need no assistance with ADLs, according to a recent study by the National Center for Assisted Living. The same study found that 43 percent of residents who move out of assisted living enter nursing homes. To the extent that these statistics suggest an orientation toward serving a population that is less impaired than Medicaid waiver clients, facilities may not be capable of or willing to serve residents with greater needs.